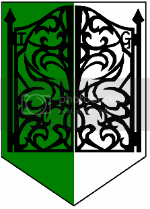 Irongate was started Fall of 1990 by Sir Ivar Nefarious and Zoe Basp as a barony under The Golden Plains, at the time a duchy under the Emerald Hills. When Irongate became a duchy for a time it was listed as the "Shogunate of Irongate". The Duchy houses many households and fighting companies. The Hounds of Zeus, Discordian Order, House Girlscouts, Pirates In Men's Pants, Draco Venatores, and House T'nirgilesti were all founded here. Also settled within Irongate are members of the Dark Riders, Unseen Hand, Legion of the Black Cross, Archangels, Nizari, House Shen Ku, and the Black Lotus Monastery. Irongate is currently the most central province of Golden Plains, and many of the Kingdom's events and allthings are held here for ease of travel. Irongate events themselves are usually attended by many of the Kingdom's populace. Irongate meets around 12:00 PM every Sunday at OW Ribble Park in Lubbock, Texas. The part of the park they typically play at is at the corner of Ave. U and 62nd street. This page was last modified on 19 November 2018, at 03:59. This page has been accessed 25,683 times.